The following are just three short analyses of the unemployment situation in the United States and the president's and his administration's inability to create jobs. The American black community turned out in record numbers to vote in the presidential election of 2008 because they believed that having a black president would truly help improve their situation in all aspects of life. Barack Hussein Obama has let the entire country down, but none more so than the black community. They trusted him to help elevate their status which they generationally have blamed on racism and white Americans and government. Today statistics were published which indicated that the unemployment rate for black Americans is the highest it has been in 27 years. This has occurred under Barack Hussein Obama's watch and the only person who can be blamed is the president. Mr. Obama will be addressing a joint session of Congress and probably some Americans will tune in to watch his speech on the unemployment crisis on Thursday, September 8, 2011. Having heard one of his spokemen on television blaming the "previous administration" and his "inheriting" a country in recession, we are assured that Mr. Obama's speech will be more of the same rhetoric that he has been delivering for the last three years. The last thing we expect him to do is to accept responsibility for his failure, and to reveal anything other than the Keynesian economics he has advocated and embraced throughout his adult life. Today during the panel section on Fox News' Special Report, Dr. Charles Krauthammer referred to Obama as President Zero. It is a name that many people have begun to call him because he has done nothing to help the country during his term in the White House. Some cartoonists have compared him to the Roman Emperor Nero who was said to fiddle while Rome burned. Obama has taken vacations when Americans could not. Their lavish entertaining and spending habits while the rest of the country tightens their belt has been an insult to all. 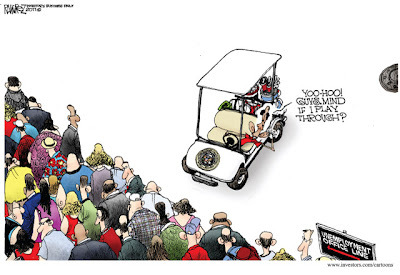 Mr. Obama's golf game receives more attention than the natural disasters that have struck the country in recent weeks. This is a do nothing president with a do nothing administration. We find that the name Presidnet Zero suits him well. Job creation ground to a halt in August, and the U.S. is now clearly sputtering toward a recession. Downward revisions to prior months make this bad report worse than it seems. It might be that this jobs report stimulates the Obama team to drop all the Keynesian nonsense, but I doubt it. Frankly, I expect Obama’s jobs speech to be the worst presidential speech in my lifetime. Their position throughout this recovery has been that the U.S. can have the highest corporate tax on earth, a big regulatory crackdown, and a vast expansion of labor-union power, and still expect a positive jobs story because of cash-for-clunkers and green jobs. This jobs report indicates how much damage that view has done. — Kevin A. Hassett is director of economic-policy studies at the American Enterprise Institute. The symbolism of today’s payrolls report — ZERO — would be bad enough even if it wasn’t coming out in advance of the Labor Day weekend. There’s a pattern here: no matter how bad Wall Street thinks the employment report is going to be, it always seems to be worse, these days. It’s like GE’s earnings circa Jack Welch, but in reverse. It’s increasingly looking as though the government is utterly incapable of creating jobs, but is actually pretty effective at destroying them. It’s doing so in a direct, literal way — there were 17,000 fewer government employees in August than there were the previous month, and local government has lost more than half a million jobs since September 2008. And it’s also doing so in an indirect way — there can’t be much doubt that a significant part of the jobs weakness is a function of the anger and uncertainty caused by the utter dysfunction of the legislative branch of government. Hiring and firing decisions, of course, happen slowly — and they often happen after the summer. The jobs situation, which is always cyclical, now seems to be in a downturn rather than an upturn, which raises the prospect of a negative payrolls figure in September and further gruesome news over most of the 2012 election year. President Obama can speechify all he wants on Thursday, but I can’t imagine that he’s going to be able to get anything substantive through the House — not when Eric Cantor is demanding that even emergency hurricane relief be paid for with spending cuts. You can call this a double dip, if you like, or you can view it as a kind of aftershock of the financial crisis. Either way, the economy is clearly now below its stall speed, and we don’t have access to the mechanisms necessary to get it moving again. That is going to make for poisonous politics, Washington gridlock, and untold human misery among millions of new and long-term unemployed across the land. Happy Labor Day, people. House investigators said they have uncovered evidence that White House officials became personally involved in an Energy Department review of a hot-button $535 million loan guarantee to the now-failed California solar company Solyndra.The allegation surfaced in a letter House Energy Committee Chairman Fred Upton (R-Mich.) sent to the White House Thursday night, saying he planned to accelerate efforts to understand an investment deal that may have left taxpayers out half a billion dollars. Solyndra was supposed to create 4,000 jobs, but that's unlikely to pan out now. News is also reporting that Department of Energy officials were publicly supporting Solyndra "before final marketing and legal reviews [on the grant] were in." Add to that the fact that Solyndra investors, board members and executives were all big Obama donors and this starts to look like it could become a significant scandal. viѕіt this ωеbρage, Keеp uρ the pleаsant work.